If you are in the business of fabricating products to distribute and sell, the odds are good that you are always on the lookout for ways to improve your business. As anyone can tell, there is a marked difference between a product that has been fabricated via quality means and one that has been relegated to the cheapest process possible. Today, we are going to be discussing how powder coating Melbourne based companies can help to fundamentally change your business in a positive way. Let’s start by discussing the history of powder coating before going over all of the attached benefits. The process of powder coating first started in Europe. The reason for the development of powder coating was simple: there was a demand to replace the need for liquid finishing coats due to environmental concerns. The first patent for powder coating was introduced in 1953 by the German scientist, Dr. Erwin Gemmer. Since then, powder coating has become one of the most accepted and highly regarded forms of finishing coats in the entire fabrication industry. Now, how can powder coating work to make your products even better and more affordable? 1) Durable Finish – Powder coating is one of the most durable and affordable finishing options on the market today. Powder coating is more resistant to chipping, scratching, and degradation due to the weather than traditional paint finishes. You’ll find that powder coating product also fight back against potential corrosion or flaking. Who doesn’t want to have a product that lasts a long time? Additionally, powder coating looks great once it is fully cured which means that you’ll have an eye-catching product as well as a durable one. 2) Environmental Benefits – Powder coating came about due to concerns regarding the environment. Nowadays, the process of using powder coating has been perfected so as to minimize the level of contaminants that are released into the atmosphere. The massive reduction of harmful chemicals means that powder coating is an effective and safe way to produce your products. 3) Efficiency Improvement – FInally, powder coating is incredibly efficient due to the very nature of the process. There is almost no waste created during the process which helps to keep the process moving along. 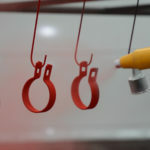 Also, due to the way that powder coating is applied there is very little time spent waiting for the material to dry on the product that you are fabricating. As a result, you don’t have to wait for paint to finish curing before moving on to the next selection of products. There has been a huge movement in the world of product fabrication toward longer lasting and more effective finishing applications. Thanks to the development of powder coating, and over 60 years of perfecting the process, your business can reap the benefits of the process today. If you are looking to improve the quality of your products while decreasing pollutants and the price of fabrication, powder coating can assist you. This entry was posted in Processing & Manufacturing.